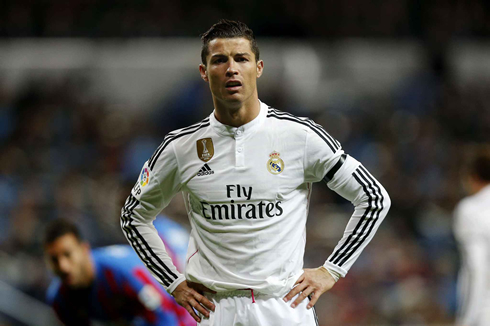 ﻿ Can Ronaldo still win the Ballon d'Or this year? 06.07.2015 » Can Ronaldo still win the Ballon d'Or this year? The race for the FIFA Ballon d'Or 2015 might still be halfway by now, but as usual, two names already stand out from the rest of the pack. With Lionel Messi currently being the major favorite to win the award, does Cristiano Ronaldo still hold any realistic chances in this very particular dispute? So now that it's the time of year when titles have been won and lost, there seems to be only one favorite for the award in the eyes of most people – Lionel Messi. The 4-time Ballon d'Or winner won the treble with Barcelona and reached to the Copa America final with Argentina, where he recently lost against Chile. So on the surface, a Messi win would be a no-brainer. But should we jump to a conclusion with 5 months of football still left to be played? Does Ronaldo still have a chance of winning the greatest individual prize in football? 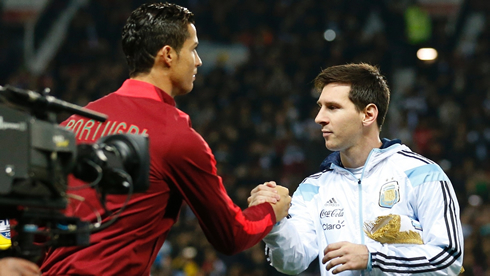 First of all, Ronaldo isn't as far away from Messi in this year's race as many consider him to be. Yes, Messi won the treble and was superb in the quest for it. But that doesn't mean Ronaldo can't win, he has his unique capabilities and we do have several reasons why Ronaldo is better than Messi. He was not very far behind with his individual contributions either, with a trophy-less season eclipsing his otherwise stunning performances all throughout last year. Along with Neymar and Suárez, Messi formed one of the most fearsome trios in the world. The cohesion within these three players and brilliant supporting roles from Barcelona's midfield, took them to the treble, not Messi alone. Ronaldo on the other hand, kept scoring and performing at the highest level even when the rest of his team was either out of form or injured. His partners in attack, Bale and Benzema, had their worst seasons in recent memory. Bale got booed by the Bernabéu crowd and looked nowhere near a player worth €100M. Benzema on the other hand, performed well only in flashes and spent some time on the sidelines with injury. There wasn't much respite for Ronaldo from the midfield either, as Modric too spent a good chunk of the season out injured. The Ballon d'Or is an individual prize and hence Ronaldo's individual performances must not be overlooked because his team was trophy-less while Barcelona won the treble this season. Ronaldo scored a staggering 38.85% of his team's goals this season. Of the 61 he scored, only 35 came from his stronger right foot, showcasing once again how he is the most complete player in the world. He scored 9 goals with his weaker foot and 17 with his head, and after struggled a little with free kicks over the last few seasons, Ronaldo seems to have found his radar again as he scored two amazing free kicks, both of which already came in the 2015 year. As far as special achievements go, Ronaldo has plenty of those too. His 5-goal haul against Granada certainly ranks as the best individual performance in a match by any player. 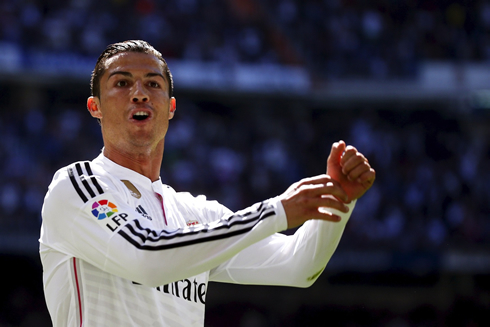 Added to that, is the fact that Ronaldo is currently on a run of 3 consecutive hat-tricks! His trebles to close out the La Liga season against Espanyol and Getafe were followed by another against Armenia, this time in a Euro 2016 qualifying match. So now that it has been established that Ronaldo isn't completely out of the Ballon d'Or race as many believe, what does he need to do to make up lost ground? Well first of all, he needs to hit the ground running at the start of the season in August. Ronaldo needs to be head and shoulders above Messi in the top scoring charts in both La Liga and the UEFA Champions League. Real Madrid leading the standings in the league right from the outset would help too. It is yet to be seen how Rafael Benítez shapes up his Real Madrid team next season but it is without doubt that the Spaniard will play it safe by deploying tactics centred around Ronaldo, which would hopefully give the Real Madrid star a fresh start compared to the torrid end last season. If Ronaldo manages to flourish immediately under Benítez, he would earn a certain amount of "brownie points" for his rapid adaptability under different managers, which again, has the potential to shift the balance towards his favor on winning the Ballon d'Or. Most players under a new manager take their time to fit in to the new system, a case even observed with his rival Lionel Messi under his initial days under Luis Enrique. Benítez's recent past with Chelsea and Napoli clearly highlights how players take their time to adjust to the new tactics before finally firing up after a couple of matches. Ronaldo has a golden chance of gaining his lost ground by thus making an immediate impact under Rafa Benítez, which would send a clear message to all football fans hinting the race for the Ballon d'Or being far from over. But perhaps the one thing that could really swing the momentum in his favor is the El Clásico match that would take place in La Liga before the end of the year. The fixtures for La Liga are usually announced late in the month of July and once they are this time, Ronaldo must circle the date for the El Clásico match in his calendar (like we all do). 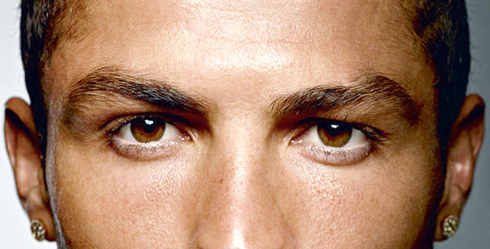 A dominant performance by Real Madrid with Ronaldo at the centre of it could really tip the scales in his favor. Ronaldo has a really impressive record of scoring against Barcelona and if he can score a couple or even notch a hat-trick in the next one, Messi could be made to look human again by comparison. The very best way to knock someone of their perch is to take them on head-to-head, and Ronaldo must use this inevitable make-or-break opportunity if he is to sway some voters towards him. 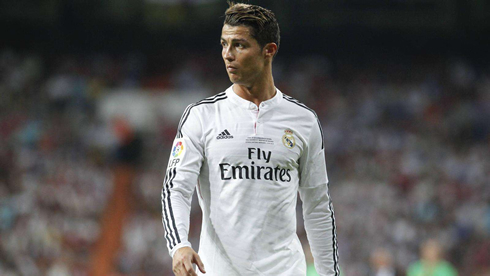 Another area where Ronaldo should focus on, is the Euro 2016 qualifiers. Messi has had a brilliant stint with Argentina, leading them to the finals of the Copa América with stunning individual performances all throughout the tournament. 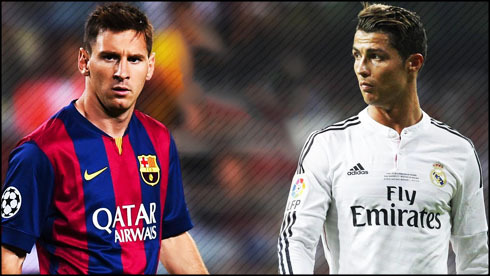 Ronaldo should therefore look forward to making an impact in the upcoming Euro 2016 qualifiers to go neck and neck with Messi in this area. Ronaldo, in fact, isn't too far behind the Argentine with his hat-trick against Armenia still fresh amongst the minds of football fans. His goalscoring form for his country is currently at an all-time best, and he can use this form to quickly shift all the attention towards him in the upcoming months and completely tip the scales in his pursuit of winning the Ballon d'Or. Lastly, Ronaldo could look up to his rival for some inspiration and add a new dimension to his game, by turning into a 'provider'. The biggest reason for Messi winning the Ballon d'Or is definitely the change in gameplay the Argenine has showcased after the advent of Luis Enrique. Messi, no longer enjoys being the fulcrum of his team and is deployed on the right side of attack. However, this small change in position has resulted in a mammoth change in the Argentine's style of play. Messi's long diagonal balls, pin-point crosses, countless key passes, chance creation and assists record and have been the highlight of last season's fearsome attacking play by the "MSN". This is certainly one area Ronaldo has received a certain amount of flak from his critics that despite playing on the wings, Ronaldo does not create a lot of chances and provides a significantly lesser number of assists than Messi. Although it can be argued that Ronaldo's style of play is completely different from that of Messi's... An "eye for an eye" would be the perfect response from Ronaldo in sealing his chances of winning the Ballon d'Or this year. If Ronaldo manages to add this new dimension to his game in the 5 or so months that remain before the Ballon d'Or gala, there would be an unprecedented amount of opinions shifting in his favor, which would completely change the equations of Messi's current chances of winning the Ballon d'Or, by putting Ronaldo at the centre of attention before the voting officially begins. So summing everything up, it is evident that Cristiano Ronaldo had a fantastic season for both club and country and has been, undoubtedly, the best individual goalscorer and player this season. Sadly, his amazing individual contributions for this season have been completely overshadowed by a trophy-less haul with his club, despite him salvaging some pride by winning the Pichichi trophy. If individual contributions are to be summed up, Ronaldo has been more vital than ever for Real Madrid, having sailed them to the second place in La Liga almost single handedly. The Ballon d'Or is an individual award, and CR7 has had a good enough individual season to win it for a third year in a row. However, his biggest challenger Messi has been earning accolades both individually and as a team, something which Cristiano has been stripped off of despite his performances. Even though there are only 5 months left for the Ballon d'Or award ceremony and Messi currently stands as a clear favorite to win the award, Ronaldo has ample amount of time to completely change the equation and turn the tables in this favor. As far as hard work goes, nobody does it better than Cristiano Ronaldo. And hard work might be exactly what Ronaldo needs to pull it all off and spoil Messi's chances of winning the FIFA Ballon d'Or next January! Cristiano Ronaldo next game will be for Real Madrid during the club's pre-season tour in the Australia, on the 18th of July of 2015. You can watch Juventus live stream, Real Madrid vs AS Roma, Costa Rica vs Jamaica, El Salvador vs Canada, USA vs Honduras, and Panama vs Haiti, all matches provided from our football live section.